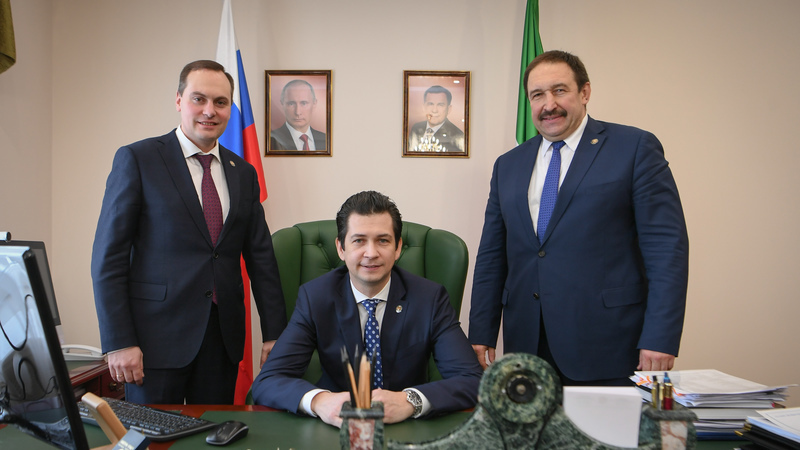 On February 8, Tatarstan Prime Minister Aleksey Pesoshin introduced Farid Abdulganiev to the ministerial staff. Artem Zdunov, who had held the post of Minister of Economy of the republic since 2014, was appointed Chairman of the Government of Dagestan the day before. Tatarstan Prime Minister noted that led by Artem Zdunov, Tatarstan Ministry of Economy implemented an important direction of the social and economic development of the republic. This is the programme of development of small and medium-sized entrepreneurship, establishment and development of infrastructural facilities of business support. Due to your personal and professional qualities, constructive relationship with the federal centre were built. During this time, the region received a significant number of benefits and funds, which allowed us to increase our economic potential. In particular, today, the gross regional product of the region exceeds two trillion roubles,” Pesoshin said. He emphasized that major work has been carried out in terms of receiving by the cities of the region the status of Priority Social and Economic Development Area. He also mentioned development of Strategy 2030. Pesoshin also noted that Farid Abdulganiev, who had previously headed Ministry of Ecology and Natural Recourses of Tatarstan, was appointed Minister of Economy of the Republic of Tatarstan. “I am sure that experience and knowledge will contribute to further successful and targeted professional activity. Only cooperative coordinated work will allow us to implement promising projects and programmes,” Pesoshin concluded.